the value of a move: "I lost one move (by playing a useless stone)"
Here's an example for the latter meaning. 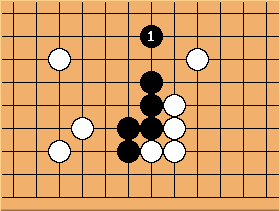 The black group is "moving" into the center with , although its individual stones do not of course move from their position. On SL you can find many pages about moves. Do a search now. Go players have many terms for different moves. The contradiction in usage about whether a pass is a move or not reflects the differing status of a pass in different rule sets. The Ing rules, AGA rules, and New Zealand rules treat a pass as a move. The Chinese rules, Japanese rules, and Korean rules do not. In rules theory parlance, the meaning is more specific. In this context, play is usually used to refer to a move played on the board, and is distinguished from the term "move" in that a move can also be a pass. This usage is not entirely consistent throughout the literature however, and sometimes the usage is reversed (whereby a play can be a pass, but a move refers only to a play on the board). On Sensei's Library, the first convention is generally followed on pages related to rules.